After over 2 years of waiting in September of 2017 I received my keys. We were finally able to get into the building and begin investigating the state of the space. Patiently anticipating this day we spent the previous 3 years trying to plan every step of this process on paper, but things don’t always translate the way you expect. 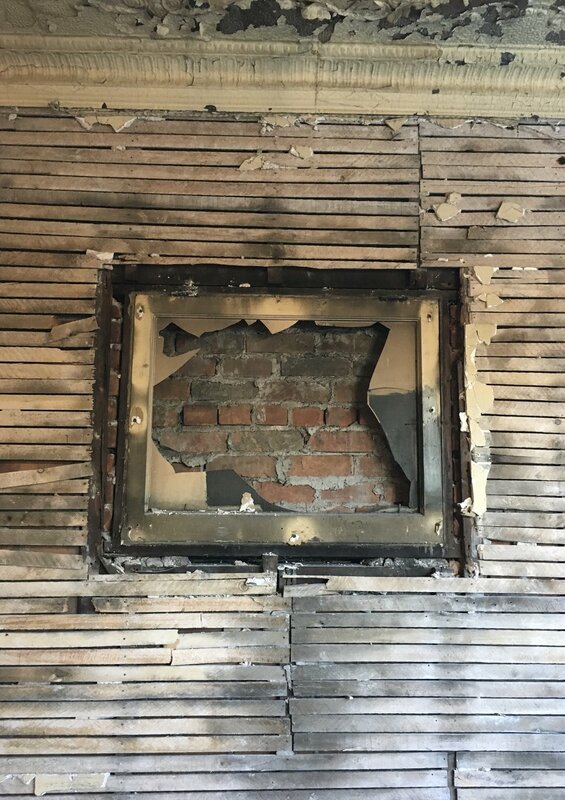 We spent about 3 months in the space removing rusted and destroyed tin ceilings, tearing down a brick wall to open up the 2 units to create a larger more open space and lastly (at least we thought) we removed lathe and plaster to expose a the brick wall you see today. After a few months of demo and prep we begin laying the ground work for the cafe, We started by insulating the ceiling with a closed cell foam. After completing the insulation we painted the ceiling flat black just before it got to cold to paint. Its now December and our electricians begin installing all of the conduit that will host our electricity. The building hasn’t had electricity for over 20+ years. With the electrical all prepped and ready we now wait for DTE to bring the building a transformer and gas/electric meters. This doesn’t happen for another 3 months. It wasn’t until the end of December that the hvac units arrived, however we were waiting for DTE. With out heat the progress slowed. and then on February 10th I broke my arm. Finally the beginning of March we got heat in the unit and begin progressing through the laundry list of tasks. Still laid up in a sling from the broken arm my friends starting showing up right when I needed them. 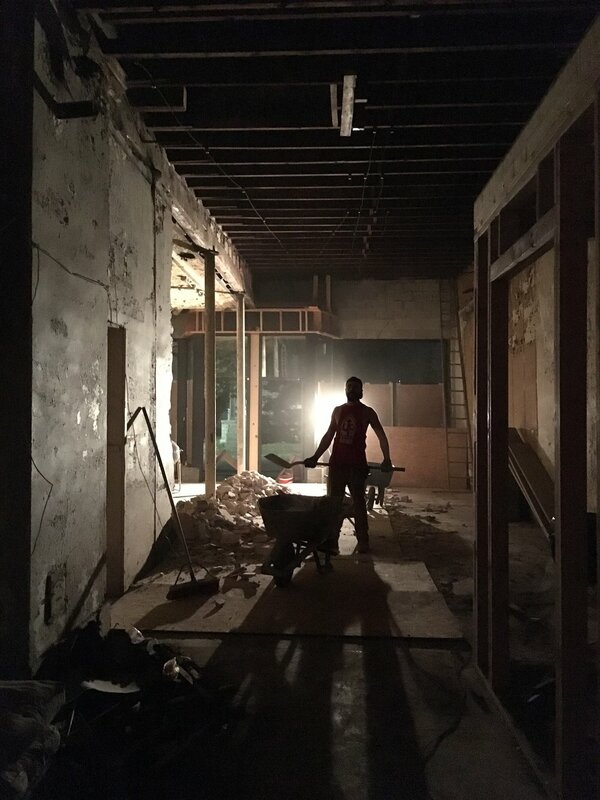 From rolling joints to sanding/staining the wood floor, priming and painting every surface in the cafe, digging trenches, loading and unloading the trailer 100 times or more, shuffling furniture, building materials, and god only knows what else in, out and around the space. you get the picture. needless to say I would have been lost with out them. After a surgery adding 8 screws and a plate to my arm, a couple months of being laid up, a little bit of physical therapy, a whole lot of winter depression and more doctors visits than I could have imagined at 30 my mortality was brought to my attention. I had learned a lot about myself, things I never imagined. I in fact have an irregular heartbeat. when life gets pulled out from underneath you your perspective has to change. Adapt or die. It wasn’t until the end of May that I was able to start using my hand again, I finally started to get my strength and dexterity back. Hindered from the injury I still needed these guys to help with so many details. 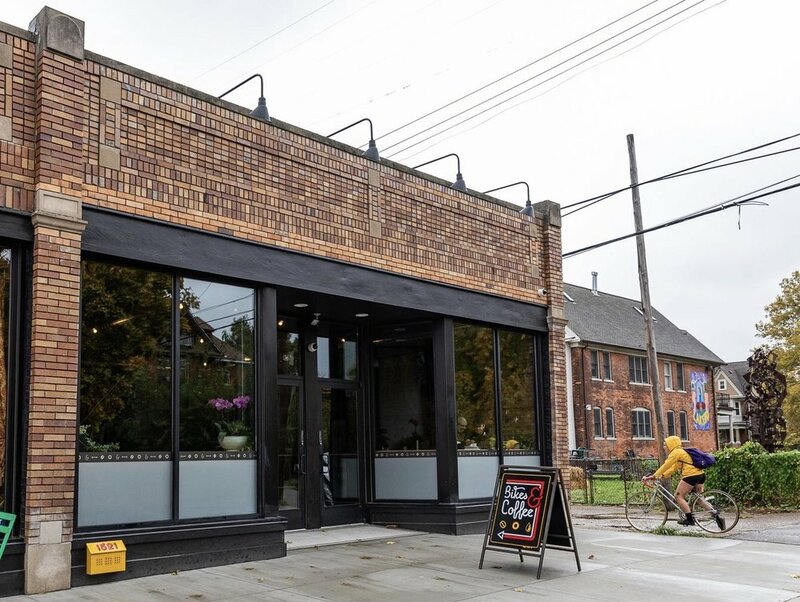 By June we were back on track, working through the details of the build out, navigating the cities inspections and permits, While working with our contractors to complete the plumbing and electrical. July/August/September flew by, Its now Oct and we are scheduling final inspections, putting all of the details together and prepping for the finish. Monday Oct 29th 2018 We opened our doors. In the last 4 years Ive learned a lot, experienced things I could’ve never imagined and made bonds that will last a lifetime. We did it, We got the shop open. I want to extend a special thank you to some of these dudes. Physically and Emotionally these individuals were pinnacle in keeping me sane and the ball rolling with this build out. This cafe wouldn’t of happened if it wasn’t for them. Sincerely I love you all and really appreciate everything you’ve done for me.